Today is the long-awaited, much publicized big day -- and I am not referring to my having completed another orbit around the sun. Today Miyazaki Hayao's magnum opus Kaze Tachinu opens nationwide. How big the hype over Miyazaki's and Studio Ghibli's first biopic? Nippon Television has been showing most of the Ghibli canon for the past two years in preparation for this opening -- broadcast rights which likely cost the network a fortune. The marketing beat has been in a steady crescendo over this time, reminding us that a cinematic event is coming. Just type the word "wind" (kaze) into Google Search and the auto-complete suggests tachinu. If you have your computer configured like mine, the screen, without even hitting the return button, displays the poster for the film and the list of theaters and show times. Miyazaki has pulled out all the stops. The film is of immense length: 126 minutes of hand-drawn animation. It tackles huge, challenging subjects: the 1923 Great Kanto Eartquake, the Great Depression and the march to global war. In addition to securing for the nth time a score by Hisaishi Jo, Japan's greatest living composer, Miyazaki roped in Matsutoya Yumi (a.k.a. Yuming) to provide the theme song. He coaxed his colorist of 50 years to come out of retirement for this one last film. And the subject of the first Miyazaki film about a real person: the life of Horikoshi Jiro, the designer of the Mitsubishi A6M, the Zero fighter. Miyazaki, who responded to the mad glee of the Iraq War with Howl's Moving Castle? Who emptied every tearduct with the traumatic Grave of the Fireflies? Who had his gallant fighter pilot condemned to living life as a pig in Porco Rosso -- is now releasing a film about a weapons platform designer? Oh no, have the historical revisionists gotten to Miyazaki too? Of course not. We can be sure that whatever Kaze Tachinu is, it will be damn complex and ambiguous, offering no easy answers -- to anything. Grave of the Fireflies is not a Myazaki movie. 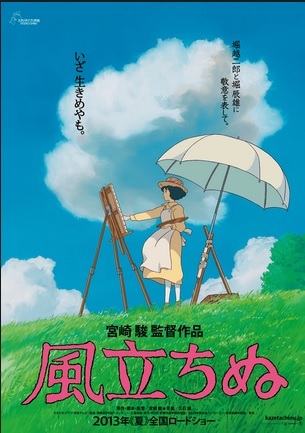 Myazaki was working on となりのトトロ (my neighbour Totoro). Both movies were produced by Studio Ghibli and released at the same time (source: Wikipedia). Some amazing stuff came out of Japan due to what many suffered, such as from Kurosawa and Miyazaki (and bat-$#!+ crazy too, such as Mishima), but those generations are nearly gone, alas. For the record, though it may now look a bit dated, 'Nausicaa' is my favourite Miyazaki. Besides being the first I saw, and first watching it Japanese without subtitles and being utterly confused and amazed, it is the most imaginative, pro-environment and disenchanted with humanity. 'Mononoke's a close second; 'Spirited Away' is beautiful, but over-rated. I didn't feel 'Howl' at all. 'Raputa' has the most mournful robots of all anime. Looking at the voice actors, I notice that Anno Hideaki is the main protagonist...What? Isn't he on the job creating another Eva masterpiece? Obviously learning from the searing NHK documentary on the making of From Up On Poppy Hill the studio made sure that cameras recorded every aspect of the making of Kaze Tachinu. The result is a full length documentary scheduled for release in the fall. In the documentary, pieces of which have been shown on television, is the staff meeting where the decision gets made to ask Anno to be the voice actor for protagonist. Using the passive voice in this instance is disingenuous, as the whole idea is Miyazaki's and the decision is his, with Suzuki nodding along and the other staff members sitting as still as statues. I saw it opening day, and it was in fact great. If the book "Eagles of Mitsubishi" (http://www.amazon.com/Eagles-Mitsubishi-Story-Zero-Fighter/dp/0295971681) is correct, Dr Jiro Horikoshi was extremely disturbed about what his aircraft was used for, and spent a long time coming to terms with what he had enabled (but its very hard to find any sort of quotes/interviews in english to back this up). So I don't think it will be a rally cry for the revisionists, and certainly not a film about a war monger. Of course that won't change the shrill cry's to the contrary. The reviews I have seen seem to put it as a quite slow movie, and more adult focused than for kids. I think its safe to say that Miyazaki will not be supporting revisionist causes anytime soon. http://ajw.asahi.com/article/behind_news/politics/AJ201307210010. Also, if memory serves, he did also say that Japan losing the war was a good thing.